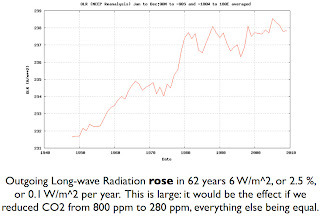 • Rising Outgoing Long-wave radiation with more than 3.7 W/m^2 per ºC SST cannot be the effect of rising CO2 or of the increase of other “greenhouse” gases. 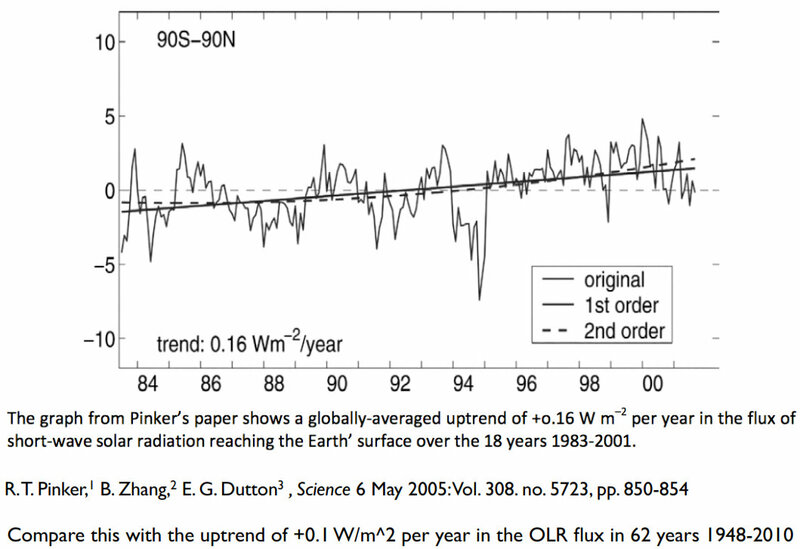 Rising OLR/SST with 8.6 W/m^2K means that the atmosphere has become more transparent to IR radiation in the past 60 years. The “greenhouse effect” has become less. Good to see such clear thinking by a fellow Dutchman, but who will get the message through to the head-in-the-sand committed alarmists? They never ever go by observational evidence, only computer projections based on predetermined yet non-existent climate forcing parameters. One day it will be realised that never mind the greenhouse effect having diminished, it doesn't even exist! I love my carbon dioide and should you and so should all of us, we need it. 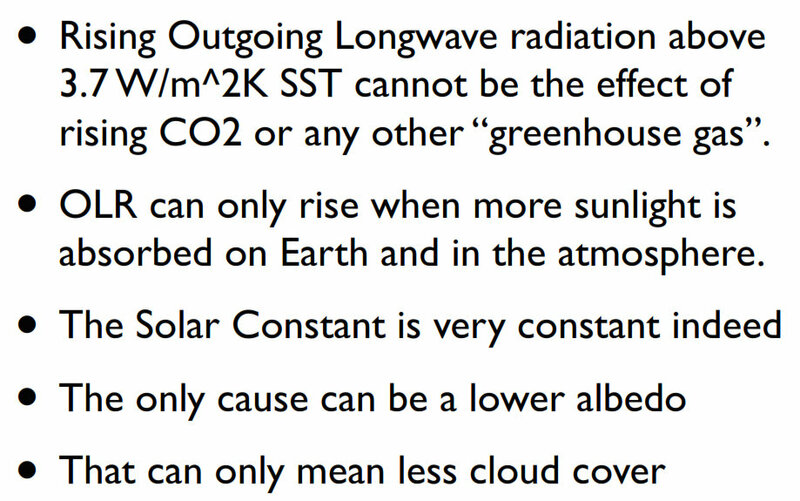 GHG have increased there is a more or less comparable DECREASE in reflected long wave radiation leaving earth. "I have read repeated Japanese Sat. 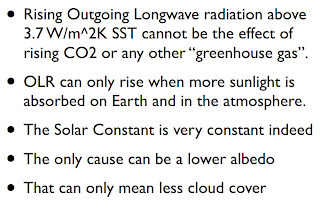 reports that as GHG have increased there is a more or less comparable DECREASE in reflected long wave radiation leaving earth." 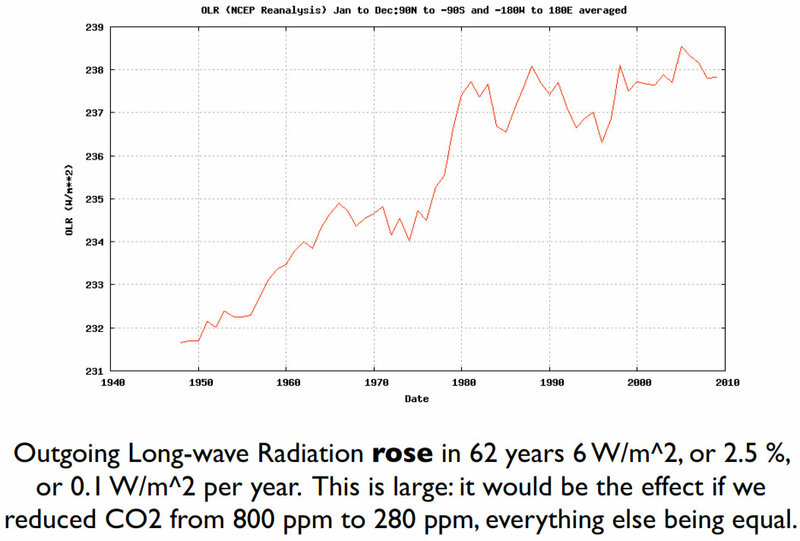 A clear positive anomaly of outgoing long wave radiation for the entire period of global warming and "rapid" increases in CO2 levels ! Although this series ends in the early 2000's the trend of positive anomaly continues although it clearly reflects the "pause" with the exception of El-Nino events. 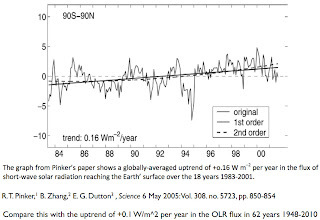 Completely inconsistent with warming caused by heat "trapping" really ! Thanks for the information. I admire the broadness of your research. Interesting that this happens at KNMI, whose former director, Henk Tennekes, was forced to resign because of his skeptical attitude concerning AGW. 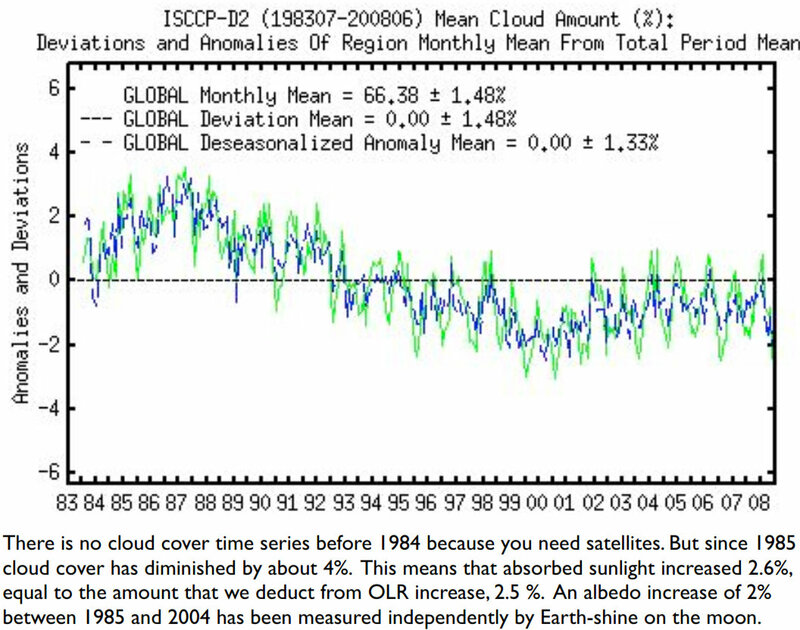 It seems that during an El Nino the atmosphere has less cloud cover and less humidity. The last extra long one caused a 10 year drought in Australia and across most of the planet however, since 2007 we have enter a strong La Nina and there has been good cloud cover and precipitation has increased. This has caused floods across most of Australia, and the rest of the world. After 20 years Lake Eyre at the centre of Australia has once again filled (twice) and the Red Centre is blooming - a sight to see. This is in contradiction to what al Gore and the IPCC have predicted. 10 year droughts appear to come roughly every 100 years or so. Drought periods followed by flood periods are a natural cycle. Since 2006 the global increase in humidity and precipitation has caused increasingly heavier snow storms and floods across the northern hemisphere each winter and this is making most glaciers surge again and the Arctic to refreeze- again against IPCC predictions. Your research is very realistic. I would suggest however that the Solar Constant isn’t completely constant as far as radiance goes when it changes from solar maximum to solar maximum. The last sunspot cycle has gone well beyond 11 years with the Sun staying at minimum for the first time in a long while. This is no doubt why the last 3 winters in the northern hemisphere have been so cold. This is an interesting analysis and I would like to see more of the presentation. Just one small point that needs clarification. 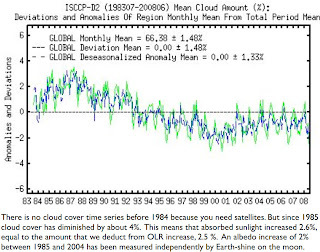 In the 3rd slide above there is evidence of an approximate 4% decrease in global cloud cover. Presumeably this results in a decrease in the Earth's albedo. The text beneath the slide indicates that earthshine measurements using the moon show an albedo increase over the same period. These seem to be incompatible observations. According to earthshine measurements (Palle et al), the earth albedo decreased from 1985 to 1997, then increased to 2007 ( recent estimates)which is coherent with Van Andel's previous assertion. Look out: Record Breaking La Niña Occurring? Is The Sun Causing Global Warming? Collapse of the West Antarctic Ice Sheet!